This post was written by staff member Nick Kloiber. Racetracks in Kentucky have been in the news due to their place in the recent legislative battle over slot machines. Some tracks have said that, because of the dire financial times, they might have to close without the added draw of slot machines on site. Other tracks have threatened to reduce purses in an effort to cut costs. 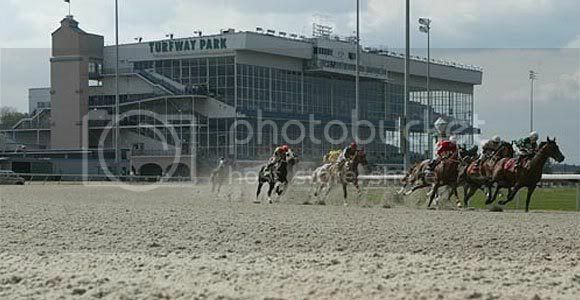 Turfway Park is one such racetrack, and it seems their solution might actually hurt them more than they originally thought, quickening a rush to closure. The racetrack has proposed a 5% cut in all purses for the upcoming year compared to 2008, a total cut of about $700,000. Gregory Hall & Jenny Reese, Turfway, Horsemen dispute purse cut, THE COURIER-JOURNAL, Aug. 26, 2009, available at http://www.courier-journal.com/apps/pbcs.dll/article?AID=2009908250345. Without an agreement with the horsemen's group, simulcast betting on Turfway's races at other tracks nationwide could be prevented by those state's horsemen's groups. Id. The law that gives these groups this power is called the Interstate Horseracing Act of 1978. Congress decided that the Federal Government needed to ensure interstate cooperation in the area of horserace simulcasting, "in order to further the horseracing and legal off-track betting industries in the United States." 15 U.S.C.S. § 3001 (LexisNexis 2009). That is a straightforward proclamation of Congress's intent and position on regulation in the industry. The way they decided to regulate, however, reveals many questions. Racetracks must get, among other things, consent from the host racing association in order to accept off-site betting. 15 U.S.C.S. § 3004 (LexisNexis 2009). As "a condition precedent to such consent, said racing association . . . must have a written agreement with the horsemen's group, under which said racing association may give such consent, setting forth the terms and conditions relating thereto." Id. Why did Congress give such a power to industry groups? Is it a legislative form of a collective bargaining grant? State's horsemen's groups can effectively band together and say they won't accept simulcasting from a track unless a contract is in place between that racetrack and its horsemen's group. With such a group effort, these groups have the power to prevent tracks from changing purse payouts or other contract issues with their local group, for fear that the changes will be rejected and their simulcast business will also be blocked. For a track in Turfway's predicament, their efforts to reduce costs to try and stay in business could very well cost them even more money due to no simulcast business, tightening what was already a precarious financial situation even more. Everyone is allowed to bargain for what they think they can get, but Congress giving these industry groups a one-handed bargaining chip doesn't help struggling racetracks trying to stay competitive and in business. Older PostWould the Commonwealth Benefit from a Tax on Marijuana?